Bangkok (Thailand) – June 2014 – As World Cup fever grips the country, lebua Hotels & Resorts in Bangkok is offering a remedy in the form of three ‘World Cup Nights’ packages that are both lively and posh. lebua in Bangkok offers two luxury hotels in one location – lebua at State Tower on the 21st – 29th floors and Tower Club at lebua 51st – 59th with its superior views, amenities and services. 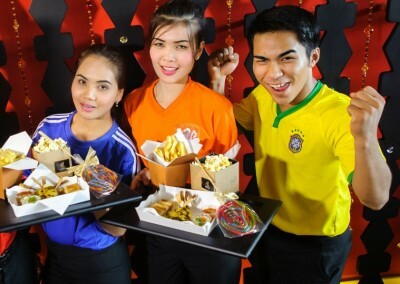 lebua has invited all FIFA fans, both hotel guests and the public, to join their jersey-clad staff for some festive ‘World Cup Nights’ with live match screenings, savory snacks and free-flowing beer at Café Mozu, the hotel’s international all-day dining venue – a theatrical setting for the occasion that provides a dramatic background for the main event. After the match, suite packages are available for those who wish to take their World Cup Night to the next level, complete with lavish accommodation, what is reputed to be the city’s best breakfast at Café Mozu, and late check-out until 4pm. Valid for bookings and stays today until July 13, 2014. Terms and conditions apply. For reservations, please call: +66 (0) 624 9555 or email moc.aubel@nvser. Visit www.lebua.com/tower-club and www.lebua.com/state-tower for more information.